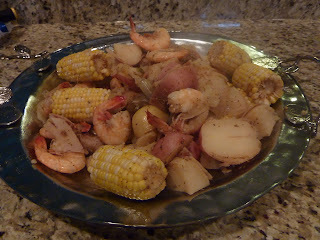 The Food Driven Life: Shrimp Boil! Shrimp Boil! The perfect summertime-dinner-outside-at the cabin meal! Unless of course you are in Texas and it is already 100 degrees so eating outside is no longer an option. I can't explain my motivation for this one. Most Sunday mornings I wake up with BBQ ribs or fried chicken on my mind, but last Sunday was different. I wanted something lighter, something different, and something festive. It was perfect for our two-person celebration. What we were celebrating, however, is in question. I did a lot of research on this recipe before I tried it - it is not hard at all, but I wanted to make sure I was aware of all the seasoning options out there. 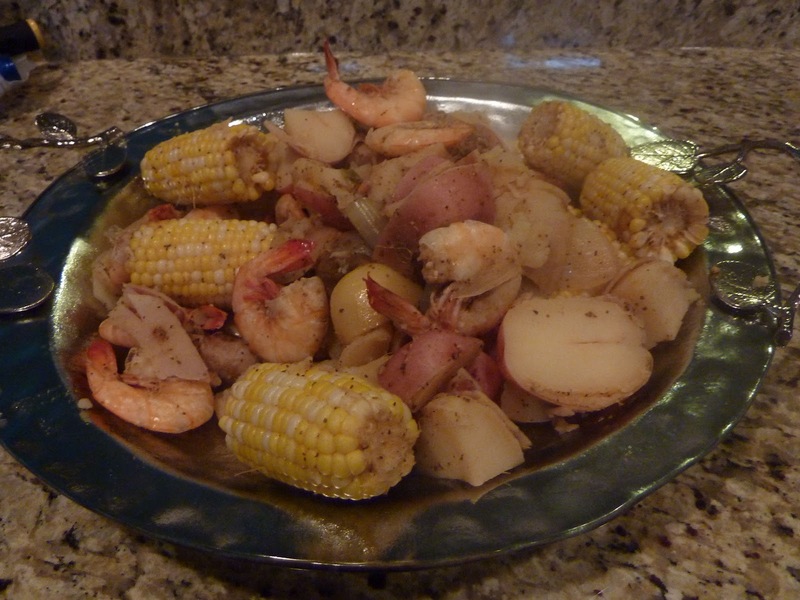 I merged a number of recipes and added a bunch of herbs from our garden, and came up with one tasty shrimp boil. Start by chopping the onion into large pieces, and cooking in butter (or olive oil), over medium heat, in a LARGE pot - about 5 minutes. Pour in the beer, then the water. Cut the lemon in half, squeeze in all the juice, and throw both halves in the pot. Mix in the seasonings and herbs. 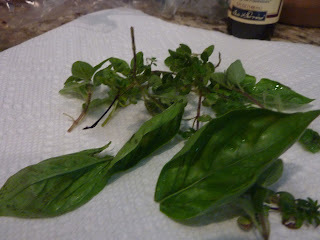 For the herbs I just grabbed a bunch from our garden - oregano, thyme, and basil. 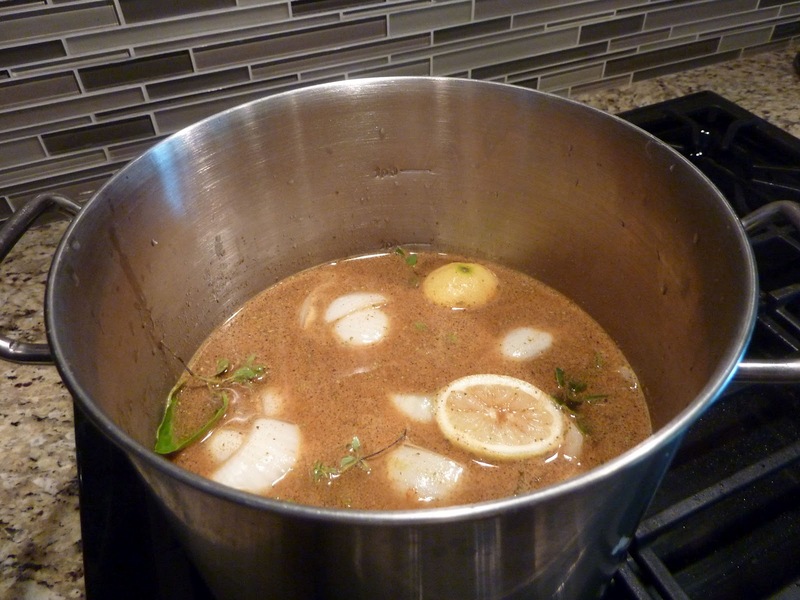 Bring to a low boil, cover and let steep for about 10 minutes. Next, add the potatoes. Let boil for about 8 minutes. Add the corn, boil for 5 minutes. Add the sausage, boil for 5 minutes more. 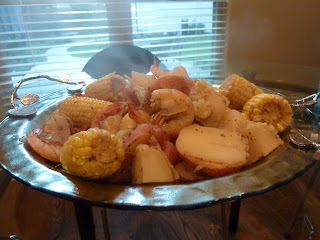 Finally, add the shrimp and boil for 3-5 minutes, until they kind of float to the top. My shrimp were huge so I boiled for the full 5 minutes. Remove the pot from the heat, and drain all the liquid. Now, if I were in Northern Wisconsin eating this, I would probably cover a picnic table with a red and white tablecloth and dump it right on there for everyone to eat with their hands, but we're not. So I put ours in a bowl, and served with delicious crusty bread for dipping (you can reserve some of the sauce! ), and our leftover cocktail sauce from here.